Your ‘fridge does the all work creating this dreamy chocolate panna cotta. Panna cotta, meaning “cooked cream” in Italian, is a perfect make-ahead dessert that will leave your guests in awe. Don’t forget the very important step of straining the liquid before plating. That will ensure a silky smooth cream. To read more about this dessert click this link: Romantic Dinner at Home. Adapted from a Martha Stewart recipe, this decadent dessert takes only a few minutes to put together and sets up in your 'fridge. Top it with raspberries or even a dollop of freshly whipped cream. Its a stunning way to end your evening. 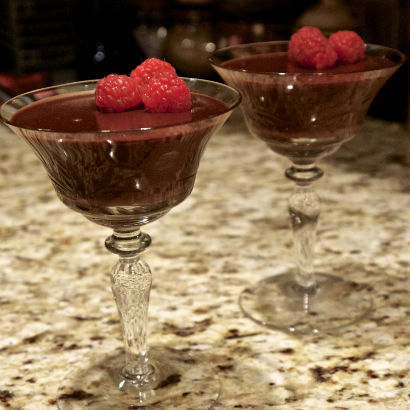 Place 4 fancy wine glass or 8-ounce ramekins on a 9" x 9" baking pan; set aside. Pour the milk in a small bowl. Sprinkle the gelatin evenly over the milk, and let soften for 5 minutes. Combine cream and sugar in a medium saucepan. Place over medium-high heat, and bring to a boil, stirring to dissolve sugar. Add gelatin mixture, whisking to combine. Remove from heat, and stir in chocolate and liquor. Whisk until thoroughly combined and smooth, about 3 minutes. Pour through a fine sieve into a large glass measuring cup. Divide mixture evenly between glass or ramekins and chill until set; at least 4 hours or overnight. To serve, top with whipped cream and/or raspberries. If you decide to also make whipped cream purchase the 16 oz container of heavy cream at the store. Use half for this dessert and the other half whip with a teaspoon of sugar. Fresh whipped cream can be made in less than 5 minutes. Store in airtight container.